This 43ft cruiser is a smart design, made even better by clever local add-ons. The hull handled well in a strong blow and the bimini kept the cockpit dry in heavy rain. The stern-mounted radar is new. The owner’s cabin is vast, spanning the hull’s full width. Elan has storage space everywhere. The galley has plenty of worktop space. Saloon table seats eight for parties with a convenient drop-leaf panel on the table. The cockpit has twin steering positions with engine controls on the starboard side. The floor is angled to support the helmsman’s feet and handrails support the backside if you want to steer from the windward side. My sailing life has been dominated by a single fact: 12 knots of wind is enough. 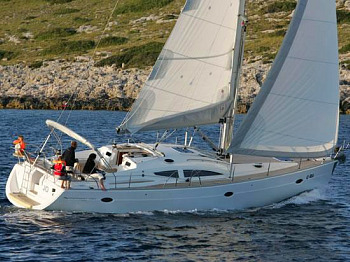 In 12 knots of breeze a yacht sails at good speed, there’s a semblance of peace on board, and the drinks don’t spill. More than 12 knots is, well, too much. On a boat test, too much wind makes photography difficult and can make it hard to evaluate some aspects of a yacht’s character. But the corollary also holds true: a good breeze teaches you, in a short space of time, how a boat tracks when under pressure, how the cockpit ergonomics work when the boat is heeled and whether the winches can handle the loads. You also learn whether you can negotiate the companionway steps without crashing in a heap in the galley. For this 434 Impression, in less than an hour the breeze went from flat calm to well more than 20 knots and back, and we learnt the hull tracks straight under pressure, the electric winches could handle the loads, and the cockpit was comfortable when the boat is heeled. While the photographer and camera copped some spray, that’s a small price for the knowledge gained in a short time. This Elan is a pure cruiser. The Slovenian builder’s house designer, Briton Rob Humphreys, has given her a modest sail area, modest draft and a clever range of accommodation layouts. You can have as many as four cabins, but the owners of this boat, who will cruise with probably only another couple on board, sensibly settled for the two cabin/two heads arrangement. The owner’s cabin aft is a stateroom spanning the hull’s full width. The ensuite also serves as the boat head and this cabin has luxuries like settees on which to recline, and a vanity table. The guest cabin forward has plenty of room, with bathroom and toilet as separate rooms—very civilised. The galley is a good one. Fridge and freezer are separate from each other and the stove has three burners and an oven. Food can be stored in slide-out mesh baskets that allow air to circulate, while the table has huge drop-leaf panels; you can sit six on the settee, another two on the starboard side. There are no opening ports, apart from the hatches. Elan’s philosophy is to give their craft good insulation properties instead. This owner had specified lazyjacks to control the mainsail when furled. The Elan system allows the lazyjacks to be led forward out of the way, and the boom bag can be rolled away, too. Importer Rod Parry says his choice would be for the optional in-mast furler. This boat was fitted with efficient batten cars so at the end of our sail, when the halyard was released, the sail plopped down obediently onto the boom. I like the simplicity of lazyjacks because I am both lazy and mechanically-challenged. The sail takes care of itself; you can tidy up later when the boat is safely fastened to Mother Earth. The anchor locker easily holds 60m of 10mm chain and Rod reckons there’s room for 80m. The electric windlass motor is mounted inside the boat to keep it away from the corrosive atmosphere of the locker. The electrical system is comprehensive. There’s a 100-amp-per-hour battery for the engine, two for the bow thruster, and three 200-amp batteries for the house—900 amps all controlled from the locally-installed inverter. The engine has a 130-amp alternator and Rod has fitted solar panels that can pump out 8.5 amps an output, which surprised him. In a breeze that topped 25 knots she ran straight and true, no frantic winding-on of the helm to keep her from rounding up in the gusts. Later, as the breeze faded a little, we saw a fraction more than seven knots to windward in 22 knots of apparent wind. We bore away to a deep reach, and she hit a peak of 8.7 knots at 120 degrees, strong figures for a pure cruiser. This is a really well-thought-out boat. The owner had only had a short run offshore, but found she handled 25 knots on the nose really well, saying she is very comfortable and the high freeboard was great. It is easy to evaluate a pure cruiser as the design intentions are clear, and it seemed to me the 434 answers the questions a cruising sailor would ask. The Impression is robustly-built. Check out the bronze and stainless steel through-hull fittings, the keel fastenings or the structure inside the stern supporting the rudder. These features alone set this boat apart and reflect a conscientious attitude to engineering for which the builder should be commended. This is, after all, an era when buyers seem more interested in the size of the TV than the size of the keelbolts.